Topic: Victorian night light holder??? This particular piece is outside of my sphere of knowledge, but I've been asked by an elderly neighbour to sell it for her, so all help appreciated. My own thoughts are that it is a late 19th century night light holder carried by the handle. It measures 8 inched in height, but am I right in my assumptions, if so, who may have made it and any clues as to what I might get her for it. The things we do to help people, but shes 89 and a lovely lady. Victorian basket, nothing to do with light (just imagine the sharp * crrrrack* of the handle as soon as you put a candle underneath); circa 1880s, verrry British. No clue about prices for these - but the magic word "victorian basket" should bring up quite a lot of prices, as these are not rare @ all. I can't say so 100%, but I have seen many pieces like this attributed to Webb or Stevens & Williams. As for the night light speculation; I highly doubt it, but believe it's nothing more than a decorative piece of Art Glass and could be used as a small flower vase too. I am assuming you believe a votive candle would go in it and it could be carried around by the handle. 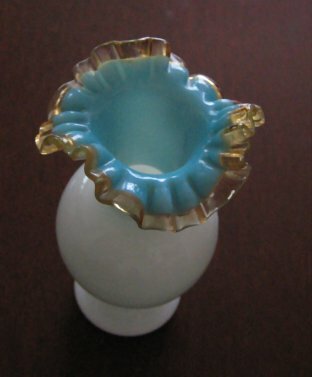 The handle itself would become to hot to touch with a flame of the candle under it, plus the glass from that period was not heat tempered and the handle would likely end up cracking from the heat. It seems that so many are always attempting to assign a specific use for everything old these days, but some old things were made just to look at and enjoy for what they are or could be used in any way the owners saw fit. It's a nice looking item, but I have no clue as to the value of it. Most of what I see like this, that actually sells doesn't often go for a whole lot, but sometimes it does, depending on who wants it and how badly they want it. I also see a lot of it setting in antique shops, with high prices on it and in need of a good dusting, having been setting there so long. Thanks Ivo and Mike, obvious about the heat now I actually think about it. No uranium I'm afraid, that was one thing I did check for. I'll report back and probably e-bay it for her over the next few days. It's a nice Victorian basket, fairly simple. Could be English or Bohemian, circa 1880s-1890s. Could be used for a posy of flowers, or for sweets, or just to look pretty on a shelf. Baskets do have a collector following- I have over 20 baskets in my overall collection of art glass. Average price I see these going here in Australia would be around AU$100-$150. Maybe less. They tend to command bigger prices in the U.S market- Victorian glass is more collectable over there. The really valuable ones tend to have applied decorations like fruit or flowers of glass. Mike is right, it could contain uranium, & this would be a selling point for vaseline/uranium collectors. Sorry for the double post-having trouble again with posts taking ages to appear. Interesting that your blue lined vase also doesn't contain uranium,Leni. I have numerous pink lined vases & baskets of similar style that do glow,particularly ones with applied flowers,leaves & fruits. I do have one blue lined basket that does glow but it is more of a custard colour than this one. Always suspected it of being Walsh Walsh "Electric Blue",but not totally sure. You'd like it, Leni, as it's studded with lots of rustic bumps & thorns! Seriously; before you ebay it you might wish to check out the completed ebay auctions for similar items, to see what people have been willing to pay recently. This is only one search and if you get creative with search terms you will likely find more listed. My search was for "Victorian Basket" and then I clicked on "Glass", left side of the screen and from there scrolled down on the same side and searched the "Completed Auctions".